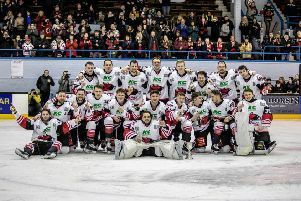 Director of hockey Tony Hand has promised “a night to celebrate” when Murrayfield Racers are crowned Scottish National League champions following their match at home to Kilmarnock Thunder on Sunday (face-off 6pm). The club are inviting fans to join the team post-game for a chance to have their photo taken with players and the SNL league trophy. It’s a first championship for the club formed just last summer and, after failing in an ambitious bid to replace previous Murrayfield Ice Rink tenants Edinburgh Capitals in the British Elite League, Racers have taken the top level of amateur ice hockey in Scotland by storm and could win as many as four trophies in their debut year. 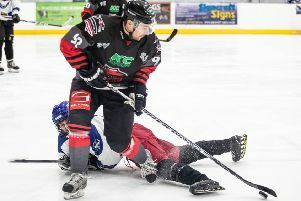 Racers had the title in the bag two weeks ago following Scottish Cup semi-final opponents Kirkcaldy Kestrels’ league defeat at Aberdeen Lynx. And, as they prepare for their final league game of the season against Thunder on Sunday, Hand said: “It will be a night to celebrate, especially knowing we’ve won it before the game. “It’s not just about the Racers – this is for the fans and the ice rink. It’s been a combined effort from all of us to try and win and it will be nice for us to all be rewarded with the trophy presentation following the game. “We have a great rapport with the fans and we’re looking forward to them coming along and celebrating with the team. While the league campaign may have drawn to a close for the Racers, the season looks likely to stretch on into May with a Scottish Cup final appearance in the offing providing they don’t let a huge six-goal lead slip in the upcoming second leg of their semi-final with Kirkcaldy. The club have already booked their place in next month’s Stuart Robertson Cup final against North Ayrshire Wild – and the end-of-season play-offs which begin in two weeks time. Hand’s thoughts were echoed by Racers team captain Joel Gautschi, who admitted the play-off finals to be held later this month at Dundee Ice Arena would be the icing on the cake to what has already been a successful season for the club.